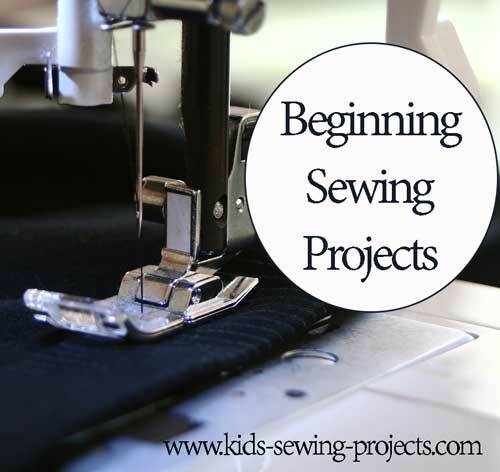 In this Level 3, beginning sewing projects and lessons, kids will move beyond making straight stitches on the sewing machines by practicing curves, corners and the gathering stitch. For each lesson we have an easy sewing project to practice the skill learned. You can submit your own beginner projects or see others submitted projects below. Check out our sewing safety page first. Then try some scissor projects to practice using and cutting with sewing scissors. These no-sew projects include tying a fleece blanket, making a fleece scarf and more. Try these hand sewing Felt Patterns! Now you will practice sewing wide curves on the machine. 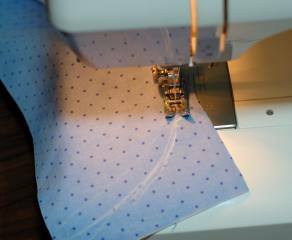 It might be easier at first to draw a line on scrap material then follow the line with your sewing. Draw a line with a fabric pencil or chalk. Work toward using the foot on the machine as your guide instead of your line. It is a great idea to use scrap material and just continue practicing. This way, you can learn what the machine will do and what you need to do without worrying so much about doing it right. We have sewing templates to practice sewing curves. 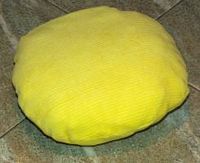 Once you've had lots of practice you can move on to this kids sewing project, sewing a circle pillow. 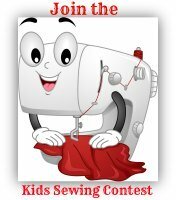 Would you like our sewing lessons and projects in an ad free, easy to read format? 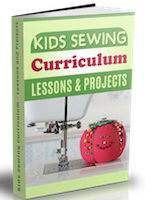 Our curriculum ebook has over 100 projects to teach kids (or adults) to sew. On a piece of scrap material practice making 90 degree angles. Sew along the side to the corner. Instead of finishing each side to the end and taking it off the machine as we did in previous lessons, leave your thread in the material, needle down, lift up your presser foot and turn your material 90 degrees. Put your presser foot down and continue on until you reach the end. Practice sewing with this sew a card project. 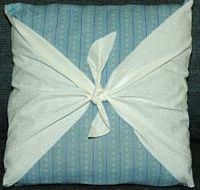 Go back and try some of these previous kids sewing projects from Level 1or 2 such as a pillowcase, pillow, or beanbag. Sew the corners as stated above. 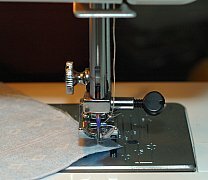 Tip: Work toward using the presser foot as your guide, this will keep you going straight when sewing corners and curves. Basting is a very basic stitch and really should be what the kids start with on the machine. It's just the longest stitch length that your machine will do. Patterns tell you to baste stitch something mostly as a guide and then you can pull it out later. On a scrap material sew a basting stitch, check your sewing manual if you aren't sure how to change the stitch length. Sew different stitch lengths and compare the difference. How to Baste Sewing Video. 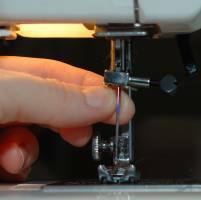 Learn how to change a sewing needle and choose a sewing needle. Most machines are the same in regards to changing a sewing needle. Check your sewing machine manual. Turn off your machine when changing your needle. Remove your needle. Replace the needle with the flat side toward the back. Different needles are used for different types of materials such as lightweight or heavier fabrics. Read your needle package for the correct size needle. When you sew with patterns and make clothes, you will add a pocket by folding the edges of a rectangle and pinning to your material where indicated. Then sew along the edges. Sewing pockets is as easy as sewing a straight line and stopping where you need to stop. 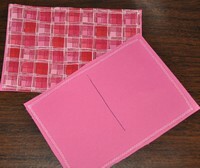 We will practice by making a pocket purse or bag where you will sew two pockets together. You can do a simple pocket project by cutting out two pieces of material about the size of a pocket. With right sides together sewing edges leaving one end open. Turn right sides out and pin open edge inside 1/4 inch. Pin pocket to a t-shirt and stitch pocket to t-shirt. Now try a Pocket Purse Project. The gathering stitch will be easy and fun for kids to see that they can gather up material with the thread. It will take lots of practice to master sewing something gathered to something else. The gathering stitch can be used for making ruffles on pillows and other items, as well as gathering the skirt of a dress to the top. Practice sewing a gathering stitch on a square piece of material. First you will use the gathering stitch, or basting stitch which is the loosest stitch or longest stitch. See your sewing machine manual if needed. Sew the gathering stitch about 1/2-1 inch from the edge of a piece of scrap material. Pull the thread from the back of your material to gather your stitches closer together. Be careful not to pull the thread too hard or the thread will break and you will have to sew another gathering stitch. How to Gather Sewing Video. 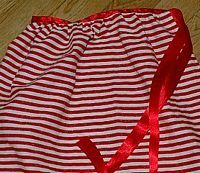 Continue practicing sewing and gathering on your scrap material, then make the following kids sewing project, a Gathered Apron or Skirt Apron. The gathering stitch can be used for making ruffles on pillows and other items as well as gathering a shirt to a bottom of a dress. Do any of the following beginning sewing projects. I recommend using cotton or cotton blend materials at this point. Make sure you pre-wash your fabric. 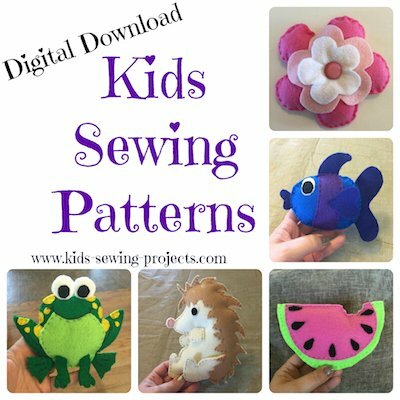 Look back at Level 1or 2, if you haven't done these projects for more kids beginning sewing projects. Do you have a Beginner Sewing Project to Share? On to Level 4 from beginning sewing projects.